Despite being a bigger fan of the recent Sherlock Holmes TV series, I still find the movies brilliant in their own right. 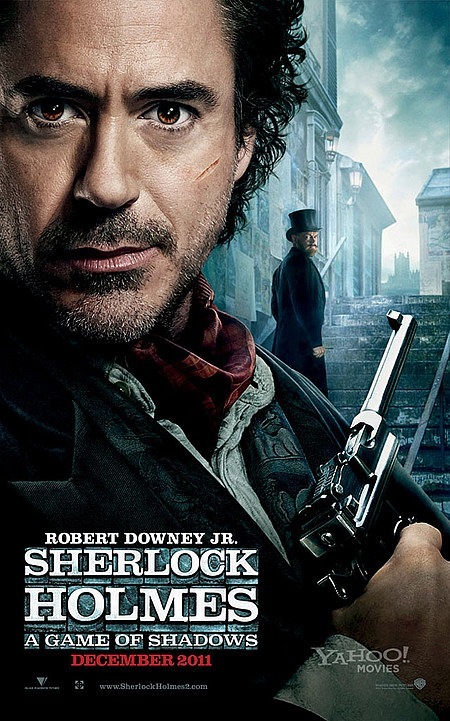 Sherlock Holmes: A Game of Shadows, raised the bar for the movie franchise. The movie had a well thought-out storyline that was made apparent about halfway through. As usual, the audience is deliberately left in the dark for the first half of the movie. With that being said, the movie was a little longer than it otherwise needed to be – the fun really beginning once the main plot had been revealed. – Moriarty is a particularly great character in this movie. So perfectly sinister and brilliant. Sherlock Holmes seems to have truly met his match in Moriarty with each taking turns at winning at their favourite game – a grand game of chess. – The use of slow motion action was more prominent than in the first movie but added greatly to the movie. Unlike most Hollywood action movies where action sequences are deliberately edited to be blindingly fast, the slow motion sequences in Sherlock Holmes were a really neat effect allowing a better glimpse of the action and another angle on Sherlock’s brilliance (fighting). – The witty and fast dialogue can be compared with the first Pirates of the Caribbean movie (before the franchise dropped witty dialogue to focus on special effects and action). Any movie with this type of dialogue is an instant winner with me and I was very impressed. Sherlock Holmes: A Game of Shadows, was predictable at times (understanding the typical Sherlock Holmes story twists) yet overall extremely entertaining. This second film built on the first and added to it in many ways. I certainly hope they continue to make sequels if they can maintain this level of quality. And for those of you who enjoy Sherlock Holmes and have yet to check out the BBC series – what are you waiting for?!? It is by far one of the most accurate depictions of Sherlock Holmes with the added bonus of being set in modern times with brilliant ways to integrate the old stories into modern times.